I left this poem in a drawer by my mother’s bed during a sisters’ weekend in Chestertown, Maryland. First, because my mother is a good sport with these staged photos. 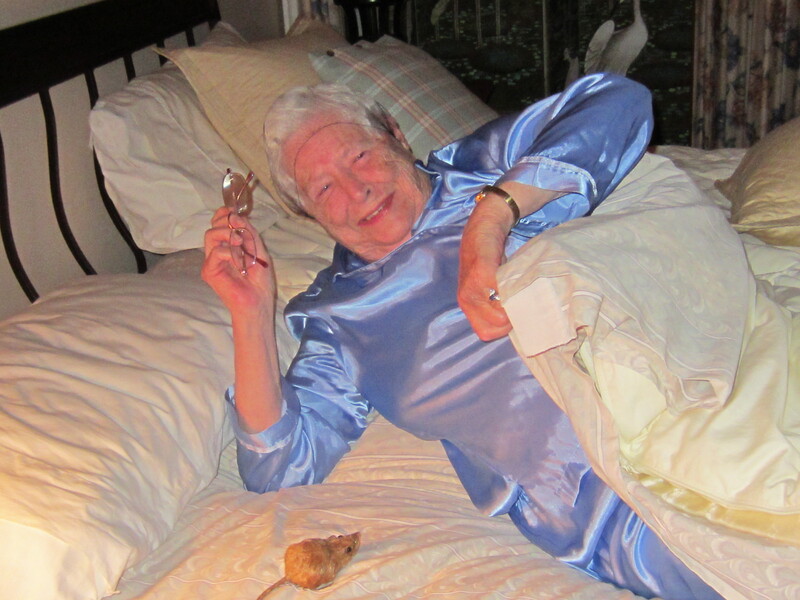 My mother’s kinship with “To Say Before Going to Sleep” begins with lullabies but ends with the title. She would not say this poem before going to sleep. She would say her prayers. 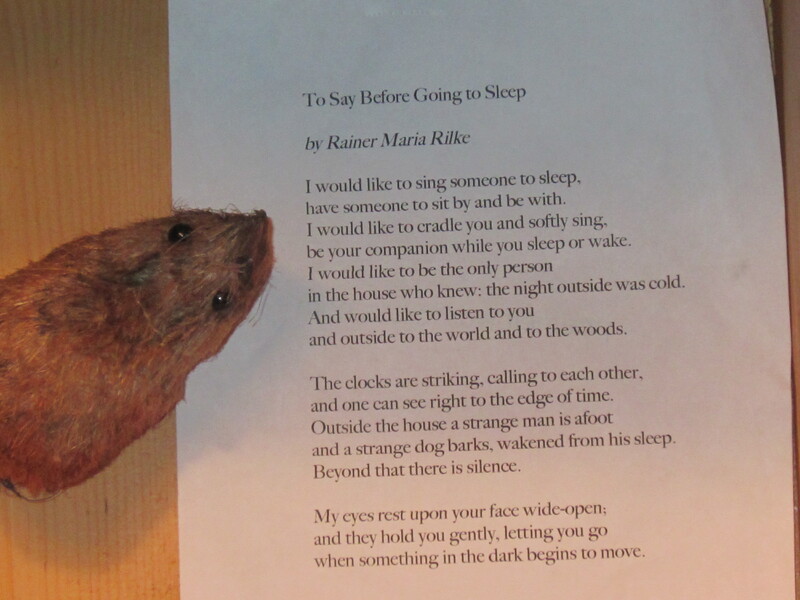 Poet Rilke grew up in a Catholic household, so surely he was taught to kneel at bedside every night with a German version of “Now I lay me down to sleep.” But Rilke, who rejected religion and replaced it with art, here replaces the normative bedtime prayers with his poem, a poem about a desire to comfort and protect. Comfort and protection, of course, are often prayerful requests made to deities. He offers his beloved (not necessarily a baby in this poem) the comfort of his lullaby and the protection of not knowing the menace that threatens such comfort. There’s a clear contrast between the danger outside of the house and the peace inside the bedroom. Only the poet, positioning himself between the sleeper and the world, is aware of both at once. Inside there’s light enough to see a beloved’s face. Outside, darkness and the unknown. Inside, soothing lullabies, predictable as breathing. Outside, random noises that startle—a clock striking, a dog barking, a stranger’s footfall. The most famous lullaby—“Rockabye Baby”—plays with a similar dichotomy. As a mother cradles her baby safely in her arms, she sings of danger, of the baby falling from a tree limb. Strange that such a song would be soothing, and yet it is. A heightened sense of danger can bring out a heightened tenderness. The two play off each other like light and dark in chiaroscuro. My eyes rest upon your face wide-open. But there’s something else here. Something that makes this poem belong to me, as if it’s part of my body, pulsing inside. After I read it for the ninth time, I realized what it was. I love this poem because I’ve lived it. Last year as my father-in-law lay dying in a hospital bed, unhooked from the respirator and feeding tube, I sang to him as he drew his very last breaths. Earlier in the day the doctor had said he wasn’t “in there” anymore, that he felt no pain or awareness as his heart and lungs gently finished out their work. But the late-night nurse said, You never know. 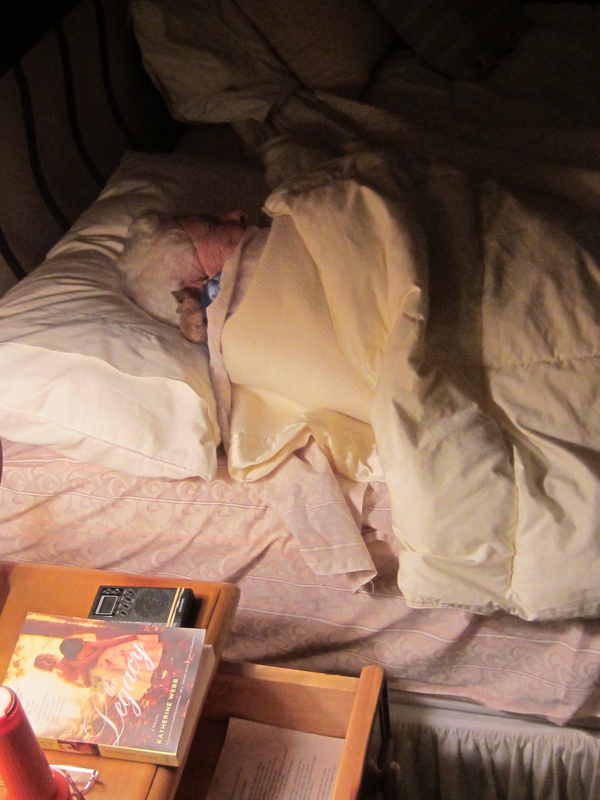 She smoothed his blankets and dimmed the lights, a quiet form of respect I will always admire her for. Talk to him, sing to him, she said kindly, but matter-of-factly, like she was reminding me to wipe down the counters after I rinsed the dishes. So I sang him all the songs he used to sing to us and to his grandchildren. Mostly I sang “Mairzy Dotes,” over and over and over because it’s a happy little tune and I knew all the words. My voice cracked sometimes when I thought about what was happening. But I kept on singing, because singing brought back the past so sweetly and held the future at bay. I sang until his breath rattled in his throat for the third time and the nurse confirmed that he was truly gone. Rilke’s poem is so connected to that experience that I read it with wonder. Ranier Maria Rilke (1875-1926) born in Prague, then part of the Austro-Hungarian empire. His given name was Rene, so he was a boy with two feminine names. His mother, grieving from the loss of an older daughter, not only named Rilke as if he were a girl, she dressed him as one until he went to school. Not surprising that his childhood was unhappy. He left the military academy his parents had enrolled him in, and studied at university. He spent time in his “spiritual fatherland,” Russia before the revolution, and there he met Tolstoy. In Paris he worked as a secretary for the sculptor Rodin, and knew Cezanne. He travelled all over the world and, according to some sources, earned a reputation as a freeloader. He was called back to Austria during World War I and died at age 51 of leukemia. Thanks, Judy. Yep, my mom is a sweetie! Happy New Year to you, too. Thanks so much for all your supportive comments. I have been reading your past posts as well, now that I have found your work. I had to comment on this one because it touched me in a very personal way. While my mother was dying at home in her own bed, (may I be so fortunate) I sang to her though I don’t have much voice any more. I sang old hymns I only knew because she sang them, I sang children’s songs I learned as a kid, I sang lullabys because I knew them from when I sang my kids to sleep. I sang to keep connected to her while she moved further and further away. I sang to her because I wish I had a chance to sing to my father who died in a hospital that shut us away from him until it was too late. You were lucky to get to sing to your Dad, lucky as I was to have the chance to make that last connection to my Mom, whether she could hear me or not. So beautiful! Thank you for sharing that. We had similar experiences and it sounds like both of us will treasure them forever in our hearts.